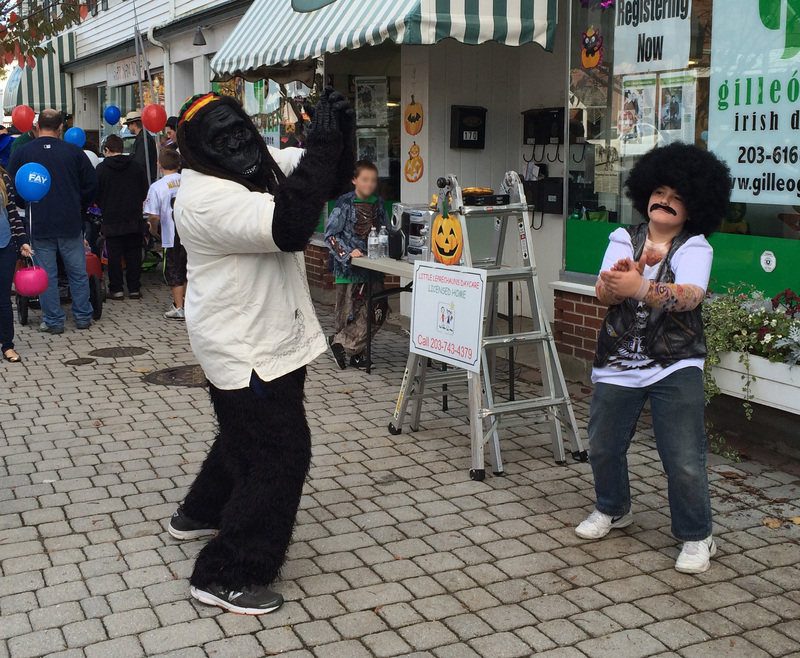 WHEN WE’D ONLY been here two months, my new town had its “Trick or Treat Street,” a daytime candy stroll before Halloween arrived. 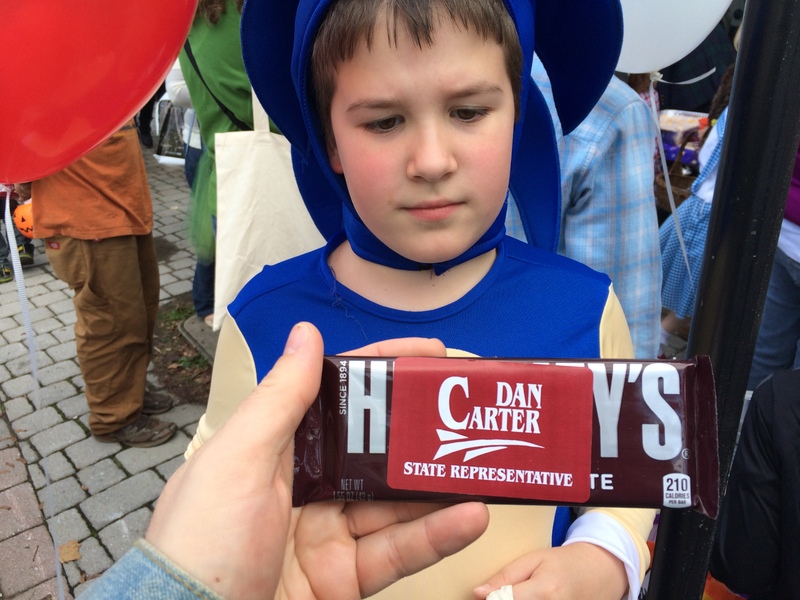 Families strolled, kids ran ahead, shops shoveled candy into bags and little orange buckets, and the local GOP headquarters handed chocolate bars with political stickers on them directly to children. I stood and just looked for long enough that people noticed me. MY KIDS DON’T go to school in my town. They go where their mom lives. She’s not rich, but it’s where a lot of rich people live. (When I drop the boys at school, there are beautiful women out jogging or waving goodbye to schoolbuses when the rest of us are on our way to work. AHA, I thought. I know where I am! I’m in Upper West Side, Connecticut!) That must be why the schools are so highly ranked, which was one of the reasons we moved to the area when separating. One of the speakers was a selectman. I don’t know what that is, but he had the bearing of someone who thought he mattered. He told the kids to watch out for drugs, and gave them the example of a boy who’d died of overdose only the year before. There were a couple of kids present who weren’t white. I tried to imagine how they’d hear that statement. Then I tried to imagine how the rest would hear it. I know how I heard it. I GOT INTO a conversation with a young woman of color when I was riding my bike around the area. I’d just discovered a little trail that let out on a sidewalk by the train station. She pointed out where she’d encountered a pickup with KKK members in it, over on the main street. I told her about having “KKK” and swastikas painted on my house growing up. I work at home a lot, and sit facing the street. Police cars sweep by my house a lot. THIS IS WHERE my kids will grow up. We moved here from Inwood, at the top of Manhattan, where the cabbies at the airport all tell you it’s the Bronx. It was a largely Dominican neighborhood; my little white boys were in the minority. I think that’s a healthy state for a little white boy. Now they’re in not only a majority, but a near-unanimity. And I’m just Dad. Their friends are about to be more important. “They get it at home,” says the standard line about various bad -isms. But in our family, they got it from school. The sexism in our neighborhood in Inwood was blatant. Street harassment was nearly unceasing. The leader of a kids’ group was excoriated by parents (of both sexes) for letting boys cook on a camping trip. (That leader was male.) Local women running a summer day camp at a school had the kids put on a skit in which the main character, a boy, went to college and all the girls sat on stage, admired him, and served him food. My kids didn’t get it at home; they brought it home from the playground, and I had to tell them their friends were wrong. They just barely believed me. Sort of. Dad countering their friends’ declarations did fly, somewhat, when they were six, seven, eight, nine. Now they’re ten, and starting middle school in a few months. They’ll be big deals, and their friends will be one big barely-differentiated sheet of white. And the selectman will probably speak again. IT’S WHITE, I say, when I’m done saying the things I love about my new town, and start on the things I don’t. Like white. Like white-white-white. There are isolated exceptions, here and there, but it’s white. The main time I see nonwhite people is behind shop counters. Overheard conversations during Baltimore were about why they would do that to their own neighborhoods. Were they stupid? I haven’t seen any burning crosses. I haven’t heard the N-word.